During early July 2016, the media reported an interesting case of an active education loan of State Bank of India sold as NPA to Reliance Assets Reconstruction Company (RARC), even while the student borrower was still pursuing the course in college. When the student approached the bank for the next disbursement of fees, only then did the bank realise that they had sold the loan account already to RARC. There have been several such complaints against State Bank of India and other banks about their insensitivity towards young student-borrowers. These banks show urgency to offload their education loan accounts to RARC for reasons best known to them. One student reportedly committed suicide in Madurai due to harassment by a private recovery agency. In another instance, Central Bank of India shamed a poor education loan woman borrower for a meager default by displaying her name on a banner at a public place. When a complaint was lodged, National Human Rights Commission (NHRC) levied a penalty of one lakh rupees on the Bank. Unfortunately, these banks do not seem to have similar courage to pull up the big and major defaulters, by disclosing their names through the media. Many banks do not follow the RBI (Reserve Bank of India) and IBA (Indian Banks’ Association) guidelines for fixing the repayment schedules, to commence one year after completing the studies. The guidelines stipulate a 15-year period with telescopic repayment instalments as schedule. However, almost all banks fix a higher amount of EMI (Equated Monthly Instalment) within a short repayment period. This forces most of the students to default and promptly after three months of default, the banks immediately classify the loan as Non Performing Asset (NPA), attracting high interest as penalty. They also sell it off to Asset Reconstruction Companies. The Government of India provides only a partial subsidy during the moratorium period (study period plus one year) as against the stipulated 100% interest subsidy. In many cases, the eligible students do not receive the interest subsidy due the fault of the banks. Banks load the unpaid interest subsidy on to the student’s account and treat it as NPA. In other words, the unpaid subsidy due from the Government of India is reflected in the NPA account dues liable for payment by the student. 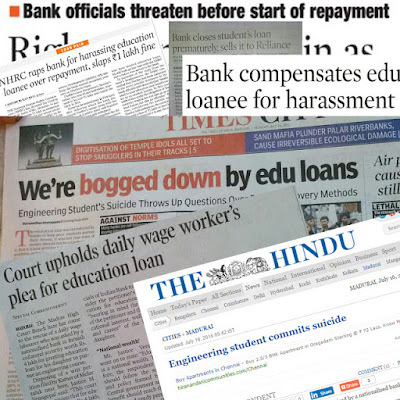 Thus the Banks due to the mis-management of education loan portfolio, create NPA artificially. If India is to become a developed nation, money should not be a hurdle for any brilliant student aiming higher education. Although the education loan scheme was designed to help deserving poor students, in reality, as on date only around 26 lakh (2.6 million) accounts with outstanding balance of Rs.60 thousand crore (600 billion) are the beneficiaries under the education loan scheme. This is less than even 1% of total bank credit. Banks tend to create a misconception among the people that banks suffer due to heavy defaults and NPAs under Education Loans. In reality, assuming the worst NPA level at 5-8%, the total NPA under the education loan segment may not exceed 3000-5000 crore (30-50 billion). The gross NPA of the banking industry is estimated at 8.50 lakh crore (8.5 trillion) and the top 100 NPA accounts in all the banks reported to be contributing around 25 to 30% of their total NPA. To hide this factual position, banks tend to create a wrong impression about the hapless student borrowers and shame them for default of smaller amounts. Prime Minister, Narendra Modi frequently talks about ‘Make in India’, ‘Start up India’, ‘Skill India’, ‘Mudra Loans’ and ‘Incubation’ to develop small entrepreneurs. But it appears that the Finance Ministry and Reserve Bank of India are doing just the opposite by discouraging small and medium segments through faulty policies. 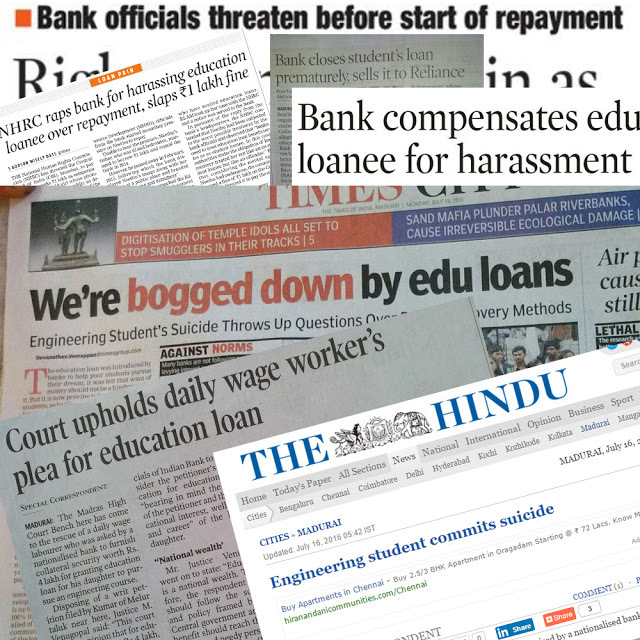 Although Education Loan Task Force (ELTF), one of the initiatives of this ezine PreSense, has taken up these issues in the Parliament through supporting MPs (Members of Parliament), nothing seems to be drawing the attention of the Finance Minister and the Governor of Reserve Bank of India in this regard. May be, we need another Janardhan Poojary to drive the banks towards the common man. by K. Srinivasan, Editor in Chief, PreSense. The author may be reached at editor@corpezine.com. Past ezines may be downloaded from www.corpezine.com.